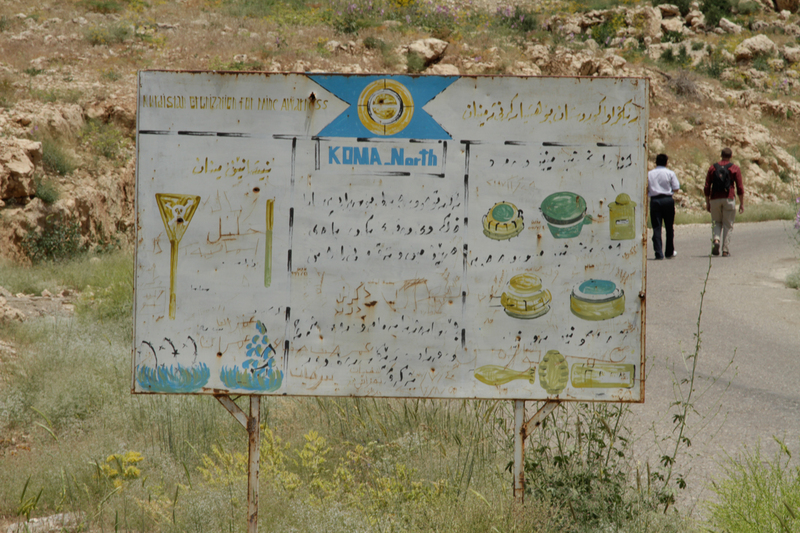 Sign warning of various mines buried in the surrounding land. Northern Iraq. An excellent overview and report on conventional weapons and related issues can be found on the UNODA website here. Iraqi Kurdistan. Sculpture: Freedom Panorama by Adnan Shino. The sculpture tells the story of the tragedies and triumphs of the Kurdish people, and is made from metal melted and repurposed from the weapons used by Saddam Hussain’s Baathist army against the Kurds. The sculpture narrates the tragedy of the Kurdish people during Saddam Hussein’s reign, the Anfal campaign and gas attacks of Halabja, the mass exodus of the people overland to Turkey, and the refugee camps that housed them there. Until recently, legal constraints were limited to a few specific types of conventional weapons. In 1980, 51 UN member states adopted a Convention on Certain Conventional Weapons (CCW) – see the official United Nations Treaty website here. The CCW bans or restricts the use of specific types of weapons considered to cause unnecessary or unjustifiable suffering to combatants or to affect civilians indiscriminately. It has 125 States parties (as of September 2018). Protocol on Non-Detectable Fragments (Protocol I) (118 States parties) prohibits the use of any weapon designed to injure by fragments that are undetectable in the human body by X-ray. Protocol on Prohibitions or Restrictions on the Use of Incendiary Weapons (Protocol III) (115 States parties) bans the use of incendiary weapons against civilians and air delivery of such weapons against military installations located within civilian concentrations. Protocol on Blinding Laser Weapons (Protocol IV) (108 States parties) prohibits the use of laser weapons specifically designed to cause permanent blindness to the naked eye. Protocol on Explosive Remnants of War (Protocol V) (93 States parties) is the first multilaterally negotiated instrument to deal with the problem of unexploded and abandoned ordnance. In 2001, at the Second Review Conference, States parties decided to amend the Convention so that it applies not only to inter-State conflicts (its original scope) but also to internal armed conflict. A unique aspect of the CCW is its ability to address emerging issues and the possibility for negotiating new protocols as new weapon types are developed, that are in need of regulation. For example, a Group of Governmental Experts convened two sessions in 2017 to address emerging technologies in the area of lethal autonomous weapons systems (LAWS)—weapons systems that can select and engage targets without intervention by a human operator. Weapons systems with full lethal autonomy have not yet been deployed but are being developed. See the page on Emerging technologies for more on this issue. Read more on the history and background of the CCW here. Read more on the CCW from the United Nations Office of Geneva here. Access the treaty text and status of the Treaty here. The Treaty, is officially known as the the Convention on the Prohibition of the Use, Stockpiling, Production and Transfer of Anti-Personnel Mines and on Their Destruction. It is also sometimes referred to as the Ottawa Convention, or the Mine Ban Treaty. It was adopted in 1997 and it entered into force on 1 March 1999. The Mine Ban Treaty is one of the world's most widely accepted treaties: over 80% of the world's countries are States Parties to the treaty. As of September 2018, there are currently 164 States Parties. Only 32 states remain outside the treaty, but most of them do not actually use or produce antipersonnel mines. Learn more about the different types of landmines and the effects of them here. Visit the treaty website here. Read more about the status of the Treaty and Landmine issue in the Landmine Monitor report here. Learn more about the Treaty and the International Campaign to Ban Landmines here. Iraqi Kurdistan. 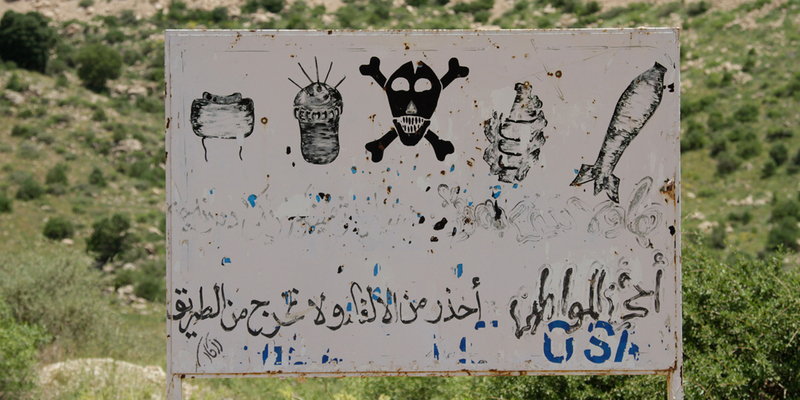 Signs warning of landmines buried in the area. Cluster munitions are dropped from aircraft or fired from the ground or sea, opening up in mid-air to release tens or hundreds of submunitions, which can saturate an area up to the size of several football fields. Anybody within the strike area of the cluster munition, be they military or civilian, is very likely to be killed or seriously injured. 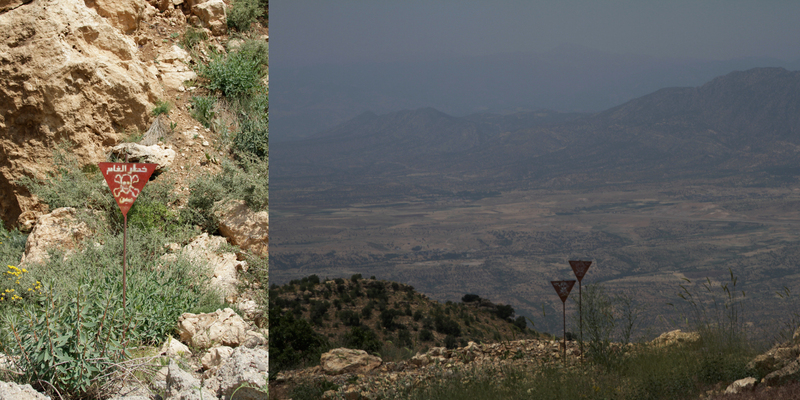 Also, the use of cluster munitions leaves behind large numbers of dangerous unexploded ordnance. Such remnants kill and injure civilians, obstruct economic and social development, and have other severe consequences that persist for years and decades after use. For more details, see The Stop Cluster Munitions website. Access the official United Nations Treaty website here. Access the treaty website here. The full text of the Treaty can be accessed here. This Convention prohibits all use, production, transfer and stockpiling of cluster munitions. In addition, it establishes a framework for cooperation and assistance to ensure adequate assistance to survivors and their communities, clearance of contaminated areas, risk reduction education and destruction of stockpiles. By ratifying or acceding to the Convention, States Parties commit to never use, produce, stockpile or transfer cluster munitions. Furthermore, States Parties commit to destroy existing stockpiles in eight years; clear contaminated land in ten years; assist victims; provide technical, material and financial assistance to other States Parties; undertake transparency measures; adopt national implementation measures; and promote universal adherence to the Convention. Access further information on the CCM from the United Nations Office of Geneva here. The Arms Trade Treaty (ATT) establishes common standards for the international trade of conventional weapons and seeks to reduce the illicit arms trade. The treaty aims to reduce human suffering caused by illegal and irresponsible arms transfers, improve regional security and stability, as well as to promote accountability and transparency by state parties concerning transfers of conventional arms. The Treaty, which entered into force on 24 December 2014, regulates the international trade in almost all categories of conventional weapons—from small arms to battle tanks, combat aircraft and warships. Ammunition, as well as parts and components, are also covered. As of September 2018, the ATT had 97 States parties. Among major arms exporters, the countries of Western Europe have ratified the Treaty, the United States has signed but not ratified it, but the Russian Federation and China have neither signed nor acceded to it. The ATT establishes circumstances under which arms can never be transferred — namely if such a transfer could violate Security Council arms embargoes or be used to commit acts of genocide, crimes against humanity or war crimes. States must deny an export if there is an “overriding risk” that weapons may be used to negatively impact peace and security, undermine international humanitarian and human rights law, or facilitate terrorism, organized crime or gender-based violence. For more information, visit the treaty website here. Access the Arms Control Association fact sheet on the Arms Trade Treaty here.